The Victoria and Albert Museum collaborated with the high street store Coast to launch the debut collection of six evening gowns that were inspired by the utterly popular exhibition Ballgowns: British Glamour Since 1950. Coast designed the line of the breathtaking red carpet gowns. Modeled by Suki Waterhouse, these dresses are the perfect option for the brides that look for original alternatives as well as for the stunning dresses for their bridesmaids. Having an exclusive opportunity to access the Victoria and Albert Museum’s costume archive, Coast’s designers came up with the six evening gown styles that ooze the glamour of the Thirties and Fifties chic epoch. The designs truly reflect the allure of ballgowns and grand occasionwear evoking the glamour and splendour of their inspiration. 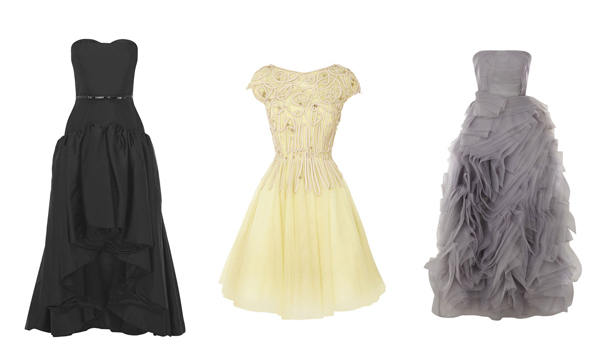 These gowns will give the opportunity for customers to indulge in a little piece of fashion history. The line includes both of the floor and knee-lengths gowns: some feature cascades of playful chiffon, while others come with the sheer inserts and rhinestone embellishment. But one thing is common- they all exude the vintage feel. Patience is an evening gown with an open back and chic decorations, which will work for the daring brides that want to look elegant and classy on their big day. Another option is wearing the Patience as a second dress at your wedding reception. Another gown that is worth of the brides-to-be attention is the Cecily: featuring the fishtail silhouette, it is made from the duchess satin in silver. The bold chiffon panels as well as the crystal embellishment add an exquisite touch to the gown. If you are looking for creating a unique look on your wedding day, consider this Vera Wang esque Phoebe. Made from the lavender organza, it features the designer’s signature skirt. Phoebe design was influenced by the photo of Norman Parkinson from the 50s. The rest of the dresses are intended for the bridesmaids. Lately there is a tendency of the shorter bridesmaids’ dresses in the informal style and this Blanche knee-length ballgown fits the trend perfectly. Offered in the trendy mint green, it features the sophisticated layers of circles as well as scallop-shaped organza. A bit of the beading and sequins add the playful allure to the dress. Another option of the bridesmaid dress is the Daphne. While creating this dress, designers found the source of inspiration in the Balenciaga and Valentino silhouettes from 1950s. Made in the softest yellow, it is embellished with the hand-sewn beads and cording on the bodice part. The Coast’s Ballgowns line has been thrown for sale in the selected Coast locations and online with the prices starting from £550. The V&A collection seemed like the perfect collaboration for both Coast and the V&A. Inspiration for this fabulous collection of dresses came from vintage dresses, beautiful and iconic fashion photography images and delving into the drawers of fashion history to recreate and bring to life this collection of contemporary ballgowns.